Intrigue in the palace: Verdi’s ‘Don Carlo’ and the Don in D.C.
LOS ANGELES—LA Opera and the Grand Inquisitor are back on Grand Avenue, kicking off the 2018-19 season with a spectacular production of Giuseppe Verdi’s Don Carlo. This extravaganza is set during the 16th-century court of King Philip II of Spain (Italian Ferruccio Furlanetto through Sept. 29, alternating with Russian Alexander Vinogradov Oct. 4-14), when Madrid was the world’s reigning superpower. Not only did the Spanish crown rule much of the “New World,” but parts of Europe, particularly the Low Countries. Of course, conquest, colonialism and occupation often require brutal militarism, and Philip’s own son, the titular Don Carlo (Mexican Ramón Vargas) beseeches his father to end the vicious suppression of Spanish forces in Flanders, the Dutch-speaking parts of northern Europe. The Spanish Crown Prince’s anti-cruelty quest is backed by his true blue pal Rodrigo, Marquis of Posa (legendary Plácido Domingo, singing nowadays as a baritone), and the “two amigos” sing a stellar duet affirming the bonds of their friendship. So what we see is that inside the corridors of power (which are brilliantly evoked by scenic designer John Gunter), members of the court are countering the king’s autocratic, despotic rule. Just as the “anonymous” author of an op-ed in the New York Times alleged there are insider participants in the “resistance” inside Don the Con’s White House. The enemy within! Further compounding the whole faction-fight-within-the-elite storyline is the Act III appearance of the Grand Inquisitor (American bass Morris Robinson), who is also at odds with His Majesty. In Verdi’s opera this Grand Inquisitor vs. King battle pits the church against the state, but this conflict resonates with the collision course Trump is on with the Department of Justice, FBI and other elements of the so-called “Deep State’s” law enforcement/judicial/intelligence apparatus—you know, those agencies which under our constitutional system are supposed to hold criminals like Don the Con accountable, though I personally wouldn’t make heroes of them. 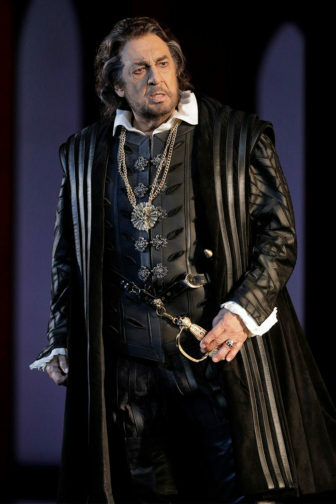 According to Vanessa Flores Waite, LA Opera’s director of communications, the companya “had discussed doing Don Carlo for a while, but the decision was finalized in December of last year.” This was well after Trump’s firing of FBI Director James “Loose-Lips-Sink-Ships” Comey, Attorney General Jefferson Beauregard Sessions’s recusal of himself from the probe of alleged Trump camp collusion with Russia, Rod Rosenstein’s appointment as the 37th deputy attorney general, the launching of the Robert Mueller inquisition—uh, I mean “investigation”—and so on. These head-spinning machinations in their chronological order are difficult to keep track of. But one doesn’t have to be Carl Gustav Jung to conclude that the collective unconscious—if not “conscious”—of LA Opera’s decision makers chose Don Carlo at this time because, while Verdi’s opera may have premiered in Paris in 1867, it eerily mirrors the ongoing struggle inside of the Trump regime that has only intensified since last December. In this epic production LA Opera returns to the recurring theme that can be summed up as the so-called “clash of civilizations.” In recent seasons, LA Opera mounted productions of Gioachino Rossini’s 1814 The Turk in Italy and Wolfgang Amadeus Mozart’s 1782 The Abduction from the Seraglio. Through these works LA Opera explored the whole “Islam versus the West” confrontation that has dominated the narrative of 21st-century history, and it returns to the stage in Don Carlo. 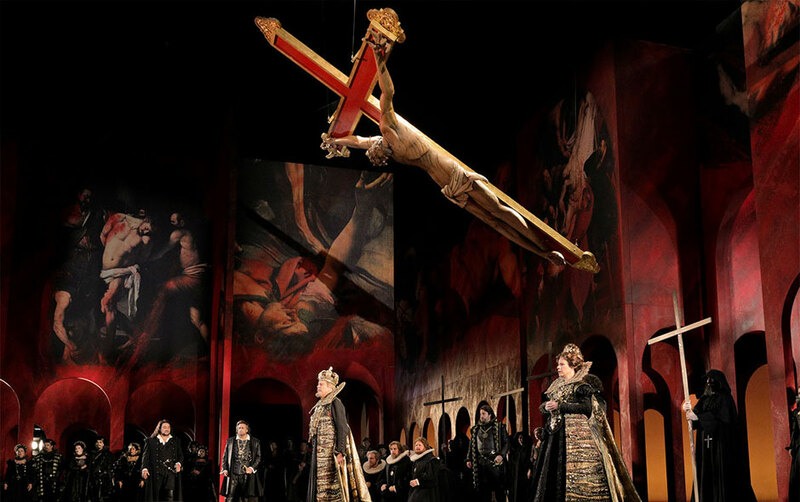 Toward the end of Act II, before the curtain dropped for intermission, an auto-da-fé—as a brilliant mass spectacle, including a gigantic crucifix with a wooden Christ affixed to it—is expertly staged by director Louisa Muller. These public punishments lynched so-called “heretics” and “apostates” during the despicable Spanish Inquisition, often with execution by immolation—burnings at the stake—and drowning (extreme water boarding). Interestingly, last season LA Opera presented another auto-da-fé in its production of Leonard Bernstein/Lillian Hellman’s Candide, based on Voltaire’s Enlightenment-era novella. If astute opera goers look closely at the infidels held captive on the Dorothy Chandler stage during this scene, they’ll see some Black performers among them, which could be a sly reference to Moors and other Muslims being persecuted by their more “enlightened” Catholic brethren. Interestingly, in a bit of clever casting, Don Carlo’s Grand Inquisitor is played by the African-American singer Robinson, who last year portrayed the Islamic extremist character of Osmin, the overzealous supervisor of the pasha’s harem in The Abduction from the Seraglio. One is a Muslim and the other a Christian, but both share something in common: religious fanaticism. Again the analogy to present times: Can anybody in the so-called “religious right” and evangelical movement kindly explain what is remotely “Christ-like” about Don the Con? I’m no Biblical scholar, but the only portions of the New Testament wherein Trump seems to be Christly are in the Book of Revelations, the Jesus of the End Times. Can any Christians possible imagine Don the Con delivering the saintly Sermon on the Mount? In addition to being dexterously directed by the talented Muller, Don Carlo’s moving sets designed by Gunter are also outstanding, and in part covered with rather bloody murals based on, according to Ms. Waite, Caravaggio’s Judith Beheading Holofernes and his The Flagellation of Christ and other paintings in the style of Caravaggio, that literally hang above the onstage action and evoke the opera’s dark themes. The eponymous Don Carlo lusts after his father’s French wife Elisabeth de Valois (Puerto Rican soprano Ana María Martínez, a perennial LA Opera favorite. In other words, Spain’s crown prince is hot to trot for his own stepmother, which could be compared to Eric or Don Jr. incestuously yearning after Melania. Although in his defense, in the first act of the French version, the Fontainebleau scene, sadly omitted from the Italian version, Carlo and Elisabeth are affianced to one another until his father claims her for himself. Our beloved Plácido acquits himself masterfully as the loyal Rodrigo, the man anyone would be proud and lucky to call a friend. Remarkably, Domingo convincingly portrays a character who is around half his actual age, which portends well for the company’s General Director and his ability to continue enthralling us on the boards. Of course, viewers can just take Don Carlo on face value if they prefer, and enjoy the sonorous music and sumptuous stage, with beautiful period costumes by Tim Goodchild. But considering that Verdi’s opera is based on poet and philosopher Friedrich Schiller’s original 1787 play of the same name, looking at these universal themes, of national liberation, among others, through the lens of today will actually sharpen and heighten one’s enjoyment of this opera. After all, Schiller was a leading humanist who wrote the words Beethoven later used for his immortal “Ode to Joy” in the choral last movement of his peerless 9th Symphony, celebrating the kind of universality of humanity that is now anathema to Trump’s troglodytes. This stunningly impressive production weighs in at almost 3.5 hours—it’s about 1:50 before the single intermission. One hour before curtain there’s a masterful lecture about the opera on the second level. Maestro James Conlon creates an exhilarating operatic experience. With its stellar, superb Don Carlo, LA Opera’s new season starts with a bang. Don Carlo will be performed Sat., Sept. 29 and Thurs., Oct. 4 and 11 at 7:30 pm, and Sun., Oct. 7 and 14 at 2:00 pm at L.A. Opera at the Dorothy Chandler Pavilion, 135 N. Grand Ave., Los Angeles, CA 90012. A three-minute YouTube video about Don Carlo can be viewed here. L.A.-based reviewer/historian Ed Rampell is co-presenting a screening of the film ‘Neruda’ plus a poetry reading with Irene Sanchez and Matt Sedillo 7:00 pm, Thurs., Sept. 27 at The L.A. Workers Center, 1251 S. St. Andrews Pl., Los Angeles 90019. 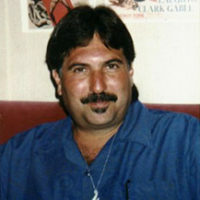 For more information, see Marxist film series.